The Valentine's weekend and hubby's birthday the next day.. !! Well, had nothing special planned for the whole weekend as we both are busy at our respective work for the whole of February, and had planned to celebrate later, but this never means I could not cook some nice recipes for the weekend to make his day special, if not very elaborate.. 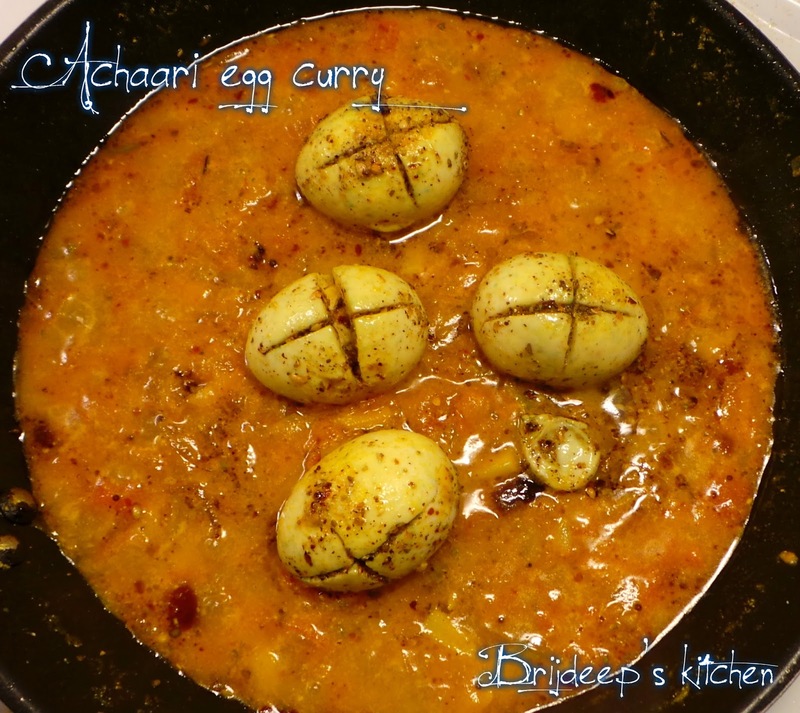 So decided on making this Achaari Egg Curry and the fragrance of the masalas being fried and the wonderful pickley (achaari) aroma filling the house bought hubby rushing to the kitchen with a song "Tumne bulaya (bhi nahin) aur hum chale aaye.." !! So here's sharing my recipe of this dish which did wonders in my kitchen..
Pickle masala from any pickle: 1/2 tsp. Add the whole spices: dried red chilli, fennel, coriander, fenugreek, cloves, bay leaf and 1/2 tsp. mustard seeds to a grinder and grind to a coarse powder. Peel the boiled eggs and make cross on them as shown in the picture, being careful not to cut the egg all the way. Make cross-slits on all the eggs. 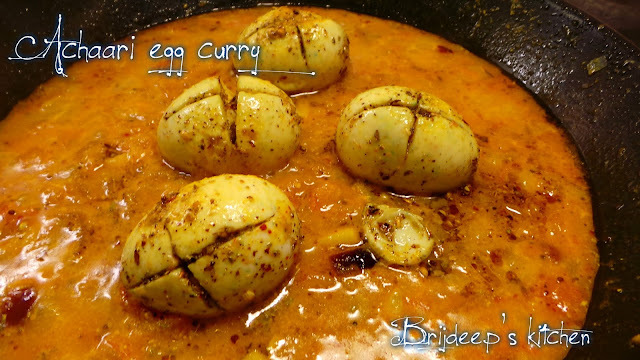 Very carefully take one egg and fill in the masala powder inside and then roll over the egg in the powdered masala. Keep aside. Repeat for all eggs. Heat 1 tsp. oil in a pan on medium flame and add the prepared eggs one by one. 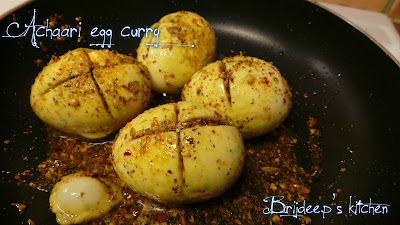 Fry them on all the sides for about 5 minutes, being careful the powdered masala does not come out of the eggs. Remove and keep aside. Now heat the remaining oil and splutter remaining 1/2 tsp. mustard seeds. Add the onions and fry until they start becoming brown. Add the ginger-garlic paste and fry until the raw smell goes away. Add tomato and green chilli, sprinkle salt and let cook until the tomatoes are soft and mushy. Add the pickle masala for the achaari flavour. Add red chilli powder and turmeric and mix everything well. Let cook for about 2 minutes. Add the yoghurt and mix well. After a minute, add 2 cups of water and cover. Let the masala cook on medium flame for about 10 minutes. 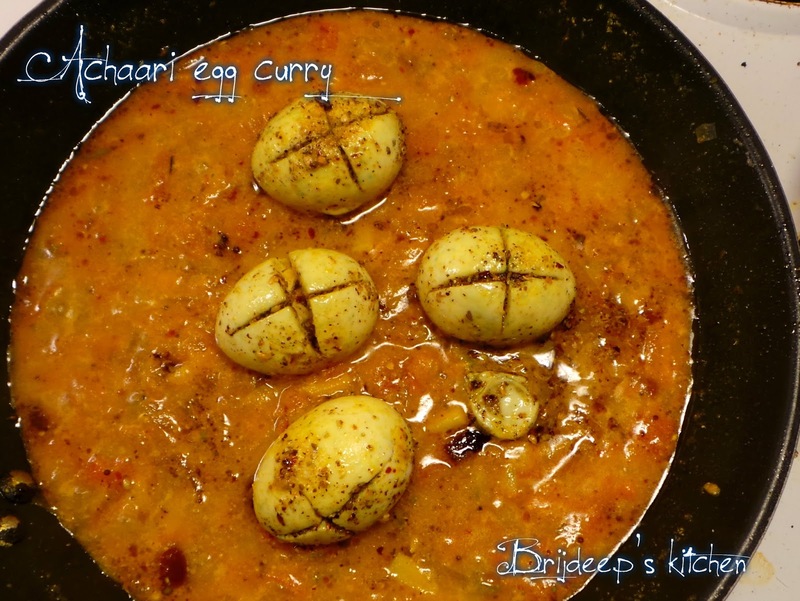 Remove cover, add the prepared eggs and mix well. Cook for 2 more minutes and turn off the flame. 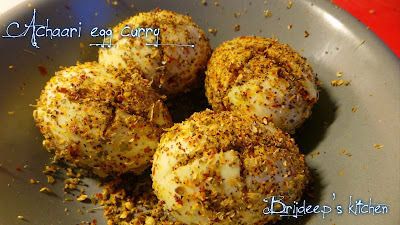 Cover again and leave for 10 minutes for the flavours to get infused with the eggs. Remove cover and serve hot !! I served with laccha paratha. See laccha paratha recipe: Laccha paratha (whole wheat). thanks a lot for the positive feedback.. Step 7. Is the masala pickle the ground masala? no it's the masala from any pickle you can add to bring out the achaari flavor..